Yes! See below for the various options and how to get started with a private knowledge base. We offer 5 different privacy settings available for each HelpSite-powered KB. By default HelpSite helps you create a public facing help site and knowledge base of FAQs for your users or customers. Just like this one that you're currently reading. Your site will be indexed by search engines. This is option is available on all our plans, including the Free plan. Just sign up to get started. Alternatively, we have an option that tells search engines like Google and others that they cannot index your help site. This is option is available on all our plans, including the Free plan. To enable this for your site, just sign up and then head to Customize > Privacy. This option makes your help site totally invisible from the public and requires each user to be invited and logged in to be able to access your private knowledge base. 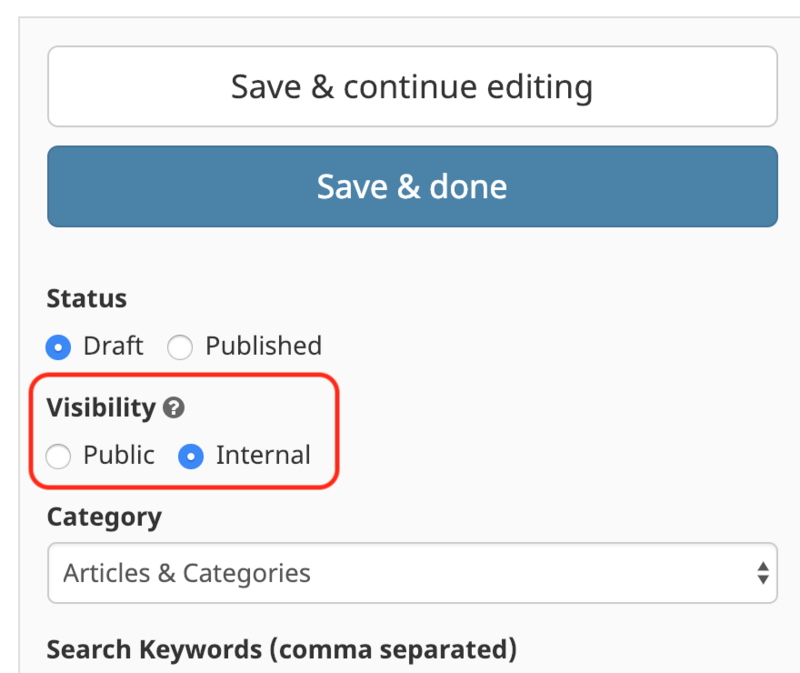 You can invite each user by email and specify which users should have access to edit your articles or be read-only to only view the articles. With this setting, each user gets an invitation by email and registers their own password, and can be removed at any time by an Admin if their permission should be revoked. After signing up for our Gold plan, just email info@helpsite.com to get SSL setup (if using a custom domain) and then head to Customize > Privacy. We offer an option to restrict your site behind a shared password. This provides a quick way to give your visitors a way to access private articles without having to have their own unique user account. Users can either enter a password directly on your help site URL, or you can create a secret link to your help site from another system (e.g. from your web app or intranet) so that users don't even need to know what the password is. To link your users directly to your shared-password-protected helpsite, just append ?pw=<your_shared_password> to your help site's URL. This will set a temporary cookie for your users, giving them access to your otherwise private site. This password can be changed at any time, locking out previously authorized users. You can also use an iframe to embed instead. 5. Private via Single Sign On (SSO), Google Apps Login, SAML 2.0, etc. We are actively exploring alternative authentication options like Single Sign On (SSO), Google Apps Login, SAML 2.0, etc. If you're interested in one of these, email info@helpsite.com with details of how you'd like this to work. Let us know if you have any questions. Reach out via our contact form or by emailing info@helpsite.com. In addition to our site-level permission options (described above), we also offer article-level permission options so you have control over which articles are visible to which users. 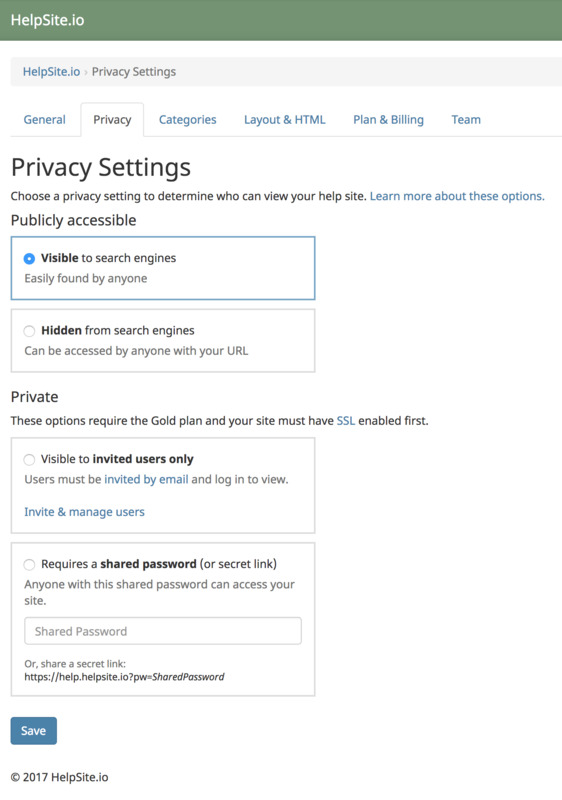 This feature allows you to choose specific articles that should only be visible to logged-in users, enabling you to have a single help site where most articles are visible to the public (or whoever has your shared password or secret link), and another set of articles visible only to logged-in users. Learn more about article permissions.